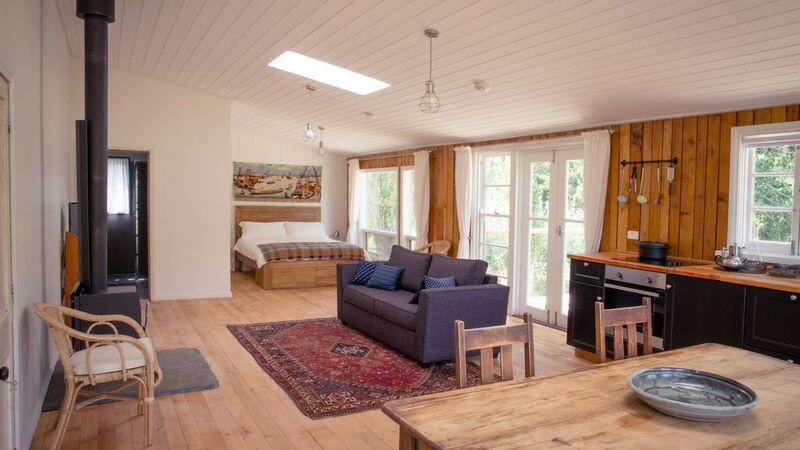 Converted shearing shed with vineyard views, stylish self catering studio. We also invite you to just relax and take walks around the 90 acre property with its pretty vineyard and spectacular hillside views and to help yourself to produce from the orchard, chook pen and vegetable garden (when in season). The Shearing Shed is a great place to stay if attending weddings, anniversaries or other events in the area. It is also a great location for an artist’s retreat - and a wonderful romantic getaway! I am a retired arts administrator and my husband manages Coriole, the family owned winery, which is 10 minutes drive away from our home at Sandalwood. We are pleased to be able to host guests in our converted shearing shed on our vineyard property. We love gardening and have orchards, vegetable gardens, ornamental gardens and a fledgling arboretum. Guests are welcome to explore the whole property, which is also home to some chooks, pigs and sheep (as well as kangaroos). We moved to Sandalwood in 2010 after living nearby at Coriole, the family winery, for many years. We love the peace and quiet of this secluded part of the world. The property has wonderful views from the hill, especially at sunset. We have large landscaped gardens around our own house which is across the orchard paddock from the shearing shed. The 12 acres of vines grow a number of warmer climate varieties (sangiovese, prosecco, barbera, picpoul and nero d'avola.) The atmospheric disused shearing shed was fun to convert - and it has been a great way to be able to share this beautiful region with our guests. We opened the Sandalwood Shearing Shed in 2016. Feedback from guests has been very positive. Guests have told us that they love the wood burning heater in winter, sitting on the deck at dusk, the peace and quiet, the morning birdsongs and the hillside walks to watch the sunset ..... as well as the proximity to wineries and restaurants. Reverse cycle air conditioning provides instant heating. The wood burning slow combustion stove and a supply of wood provide cosy heating. Guests are welcome to access the washing facilities in our house on request. Guests are welcome to use the clothes dryer in our house on request. Living area with sofa (sofa bed) and two easy chairs. Oil and vinegar and basic condiments are provided. A full set of dishes and utensils are provided. The kitchen has full cooking facilities, with a three burner cooktop and an oven. Guests are welcome to wander through the extensive landscaped house gardens across the paddock. Bicycles are available to borrow ion request. Lovely open deck surrounding the kitchen/living area with outdoor table and chairs and a shade umbrella. The Willunga golf course is 7km away. We loved our stay in the charming, Sandalwood Shearing Shed! This cozy place is modernly transformed, in a peaceful setting, close to a couple of small towns and many wineries. Plenty of kitchen amenities allowed us to stay in and cook one evening. We highly recommend staying here. Had a fantastic stay. The shearing shed was a pleasant surprise, great location as a short drive to town and numerous wineries, but also quiet and tranquil. We loved sitting on the deck looking over the vineyards. Clean, modern and highly recommended. We had a lovely weekend away. The place feels secluded but is still very close to the main strip of shops. It’s a fantastic location for getting around to the local wineries. The bed is very comfy and the shower is amazing (high pressure). The kitchen is well stocked with all the necessities for cooking as well as a delicious bottle of local red. Highly recommend! Thanks Tahlia. It was a pleasure to host you and your family. Such a beautifully presented property. Was just what we needed to rest and recover from daily grind. The shearing shed is the perfect place to relax and unwind. The beautiful grounds and secluded apartment made for the perfect retreat. Waking up to the Rosellas and breathtaking surrounds was such a luxury. The apartment itself is well presented and maintained. They were the perfect hosts who provided us with a great selection of teas, coffees and milk. They also had everything needed to make a meal or have a bbq. The bed and bedding were extremely comfortable and the shower was amazing. Would love to go back in winter to have a campfire or snuggle up inside in front of the wood heater. What an amazing find and lovely way to spend our 10 year wedding anniversary! We had a lovely stay in this beautifully renovated shearing shed! The bed was sooo comfy, the complimentary wine delish, and the beautiful surrounds enchanting! Wish we could’ve stayed longer to explore more...but we will be back! The Sandalwood Shearing Shed is right in the heart of the Fleurieu Peninsula. There are numerous well known wineries with cellar doors and restaurants to visit in this region. The nearby beaches (including Port Willunga and Maslin Beach) are famous for their geological interest and beautiful aspect. The McLaren Vale township is a 10 minute drive away and it has supermarkets, butchers, bakers, banking facilities and doctors surgeries. The famous Willunga farmer's market is open on Saturday mornings.